A recently released documentary, "Pandora's Promise" explores the transformation of staunch anti nuke environmentalists into believers of the benefits of nuclear power. This is a must watch film as these activists believe that nuclear energy could really transform the world. Governments around the world including most recently President Obama have been discussing strategies to address the climate crisis. Nuclear is the only source that can provide additional supply of base load power without hurting the atmosphere. These environmentalists are seeing a major gap between fossil fuels and renewables like wind and solar. Renewables are unable to make up the gap alone. Coal, natural gas and oil demand is still growing. Being anti-nuke is a dangerous policy in light of the rising demand for fossil fuels. Do not be surprised to see more mainstream environmental organizations support the development of next generation nuclear technologies that are safer, more efficient and cleaner. The documentary debunks a lot of the nuclear myths that came out after Fukushima which caused a mass hysteria and knee jerk reaction by both the German and Japanese Government. Now two and a half years later Japan is turning reactors back on and Germany may soon make a pivot towards nuclear as electricity costs have skyrocketed. 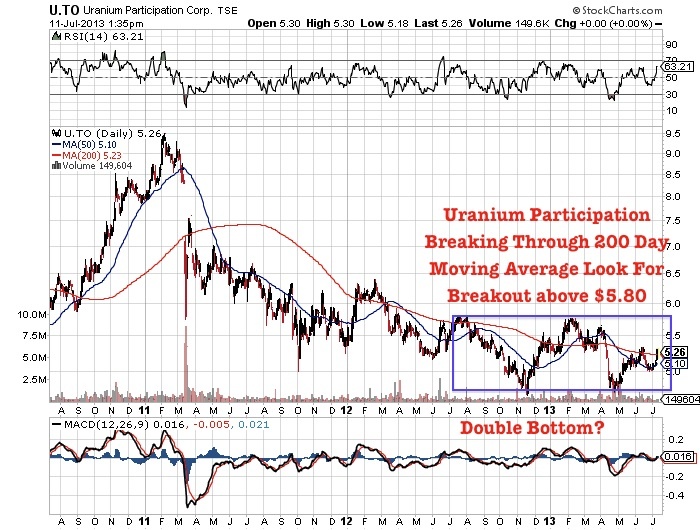 Uranium appears to be making a double bottom and is breaking through the 200 day moving average to the upside. This documentary should be watched especially by Anti-Nuke environmentalists. See the trailer below. 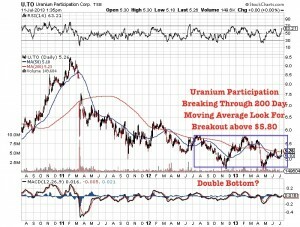 More and more investors will realize that uranium and rare earths are critical to the coming clean energy boom. These metals are all in a major supply shortfall that will need to be made up by the junior miners. For some time I have informed my readers to look for rare earth supply that comes as a byproduct from uranium production. Most investors do not realize that the heavy rare earths which are in a supply deficit was produced in North America in the 1980’s as a byproduct of uranium. I am very bullish on both the uranium and rare earths as they are the critical materials for clean energy where demand is soaring, yet supply is extremely constrained. I have searched for uranium and rare earth deposits at the feasibility stage in proven mining camps with infrastructure and local support. 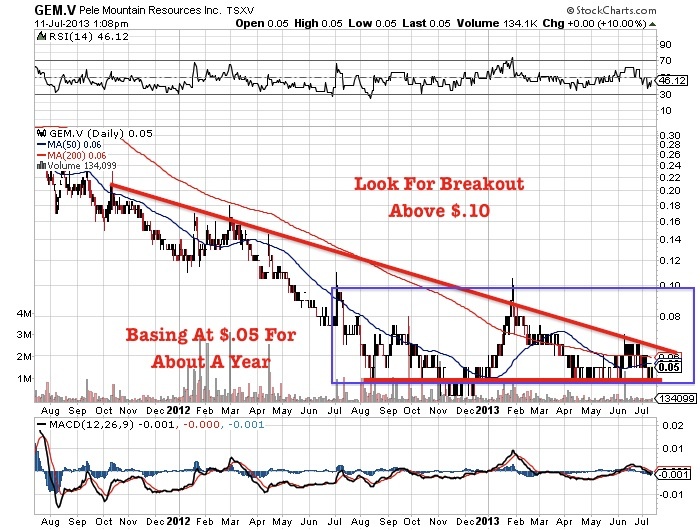 One that I have found, own and informed my readers about since early 2012 is Pele Mountain Resources (GEM.V or GOLDF). Pele Mountain’s flagship Eco Ridge Uranium/Rare Earth Project is located in Elliot Lake, the only mining camp in Canada to commercially produce heavy rare earths. For forty years, Rio Algom and Denison produced over 300 million pounds of uranium in this mining district. I believe Pele Mountain could be a winner in this race to critical rare earth production outside China. Having a project in a proven mining camp being advanced by former Rio Algom management with local support and great infrastructure is a great advantage. The geology, mineralogy and metallurgy is well understood. Pele Mountain Resources announced a major increase in uranium and rare earth resources at its Eco Ridge Mine in Elliot Lake, Ontario, which I believe could help attract attention from strategic partners and industrial end users. Pele announced a 116% increase in inferred resource and an increased grade. The company expanded the higher grade zones which should improve project economics. The company showed that the combined uranium and rare earth resource has a uranium equivalent of 0.1%, which exceeds the grade of currently producing uranium mines and several large ones in development around the world in riskier jurisdictions. The new resource update Pele Mountain published showed a major increase in uranium and rare earth resources which boosts shareholder exposure to clean energy metals which I believe are the metals of the next century. The world we live in today is looking to reduce air emissions and the carbon footprint. Utilities need uranium as a clean base-load power that does not produce noxious emissions. Rare earths are critical for clean energy such as hybrid vehicles, wind turbines, high efficiency lighting and solar. The source of these rare earths are currently being imported from China. Over the next few years there will be additional projects particularly in North America which could supply these critical rare earths which are in a near term supply shortfall. 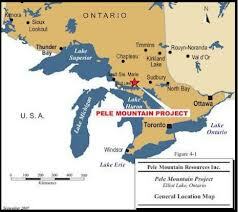 Pele Mountain is located in Elliot Lake, a proven mining camp which is a past producer of uranium and rare earths. Its the only place in North America which produced heavy rare earths. Pele Mountain provides leverage to both uranium and the critical rare earths. The company put out a robust PEA which shows impressive economics. This updated resource expansion should positively impact economics and Pele's path to production. 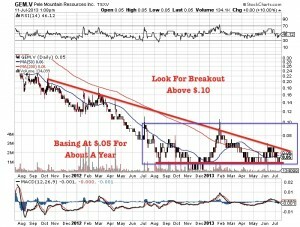 Pele Mountain has been basing for more than a year and may be on the verge of a trend reversal. Look for a breakout above $.10. Remember Pele Mountain has a team who worked in Elliot Lake with Rio Algom for decades. Rio Algom was able to produce uranium for over 40 years when uranium averaged below $20 per pound and rare earth applications were relatively unknown. Over the years, rare earths have grown exponentially more valuable in technology and clean energy and since then the uranium price has doubled. Major institutions such as JP Morgan are predicting uranium prices could move to $90 in 2016. This increased resource provides Pele Mountain shareholders with great potential leverage on both the uranium and rare earth price. It also suggests that the higher long term prices for uranium and rare earths will be the catalyst for the Elliot Lake Mining Camp to restart uranium and rare earth production. In the report the author states, "Pele continues to demonstrate its ability to expand Eco Ridge, successfully adding 21.9m tonnes to its overall MCB resource (up 58%). Pele has also successfully outlined a large higher-grade starter zone which is likely to have a positive impact on project economics. The updated resource at Eco Ridge strengthens our belief that Pele’s current market valuation leaves room for upside, particularly considering the project’s advanced, pre-development stage, the completion of a positive PEA, and the demonstrated potential for further expansion. We believe Pele is positioned for success as a developer of a geopolitically secure supply of U3O8, Critical REO and scandium oxide. We maintain our view that if investors believe in a sustained material price appreciation of U3O8 and REOs beyond current levels, GEM is a prime investment candidate based on its historic correlation (and leverage to) uranium prices, sizable near-surface resources, well-scoped project, supportive jurisdiction and well understood path to permitting and development." Disclosure: Author/Interviewer is a shareholder of Pele Mountain and the company is a sponsor on this website. Is the Correction in Precious Metals, Uranium, Lithium and Rare Earths Stocks Over?